When school is approaching, that means shopping for products. I have been doing the school thing as a mom for six years, going into my seventh. Here are some of my favorites. There are a few ways you can go when buying a backpack. Way number one is to buy the cheapest backpack you can find and expect (hope) it will last your child through the school year. The perk to this way is that your child can have a new backpack that suits his/her current style preference each year. The bad thing is that while it is cheap one year, all of those years can add up over time to end up being more expensive than a nice backback. Way two is to get a halfway decent backpack and hope it lasts your child a couple of years. The third way, and way I have gone, is to get a really nice backpack and make your child use it until the thing is used into the ground. For preschool, Brayden had a cheap backpack (well, it wasn’t cheap in prince since it was a Steelers backpack my parents had bought for him, but the quality turned out to be not so great). The zipper broke part-way through the year, which is often a problem with anything inexpensive that uses a zipper. For Kindergarten, I was at Ross and found an adidas backpack for $20, which seriously can’t be beat. I went ahead and bought one for Kaitlyn as well even though she was a year away from needing one for preschool. I super love the adidas backpack. Brayden is going into his sixth year using the same backpack. Same one people. It is fantastic quality. Kaitlyn has been using hers since preschool and is going into third grade, so going on her fifth year of using it and it is still in perfect shape. They have gotten dirty, of course, and I just put them in the washing machine and choose my hand-wash cycle and good as new! This post contains affiliate links. When it came time for McKenna to go to school, I didn’t consider any other brand. I was not able to find one at Ross or any other comparable store so I purchased it from Amazon, which was more expensive than $20. I went with the adidas Hickory 2 Backpack. We actually got the last year’s version, but this is the updated version. There are a lot of options if you search Amazon for an adidas backpack . You can even get the sport ones and double it as a backpack. 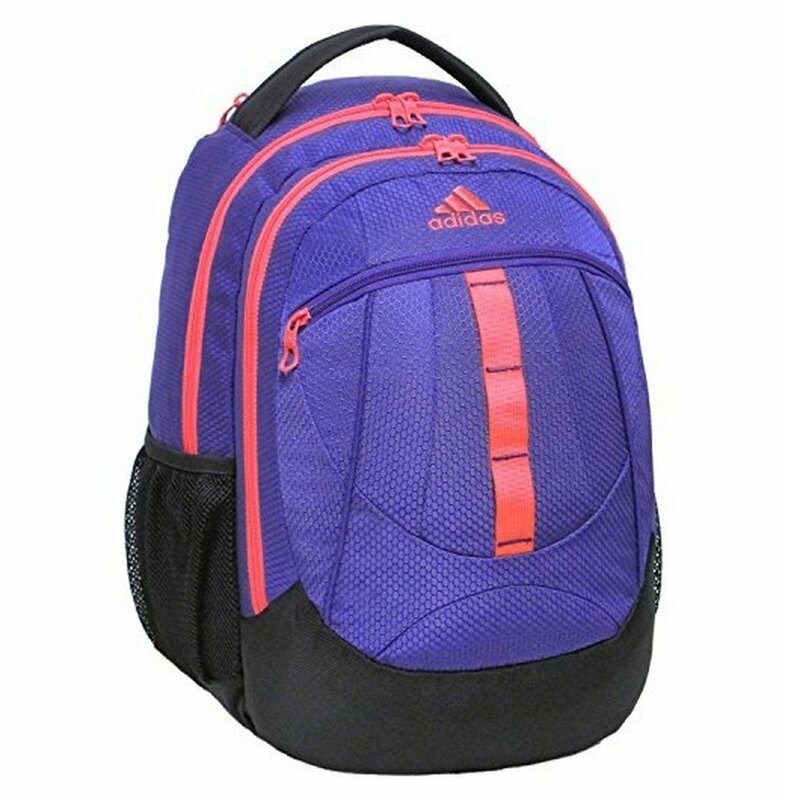 Kaitlyn got the adidas Estadio Team Backpack II for her soccer bag and it would completely work as a backpack if you have a child who is taking a ball of some sort back and forth to school. You really can’t go wrong with an adidas backpack . Another important item for school is shoes. You will want to be familiar with the shoe policy at your school. No matter what the policy is, just be sure your child is going to school in shoes that will allow your child to get the physical exertion needed during the day. There are a lot of cute shoes you can get, but even my girls end up wanting to wear primarily tennis shoes to school so they can be active during recess time. When buying tennis shoes, I have found that it is less expensive to buy nice tennis shoes rather than cheap ones. A nice pair will last your child through the school year even with everyday wear. The cheap kind get holes in the soles very quickly and you end up spending more to replace the cheap ones than you would just to buy the expensive ones from the beginning. We aren’t partial to any one brand. We jump around based on what feels good that year. Some brands we have liked are Sketchers , Nike , and New Balance . As much as I love Payless shoes, for us I will not buy tennis shoes there if the child is in first grade or older. Every teacher will give you a list of supplies needed for the school year. If your school is anything like my school, the lists will vary from teacher to teacher. No matter what is on your teachers list, however, you will need good pencils, even if it is just to have at home. I haven’t tried a lot of brands because we found one that works and we have stuck with it. We use Dixon Pencils, #2. They write well. The lead doesn’t break easily. And most importantly, the erasers actually erase. While I haven’t bought a lot of pencils, we own I think a million and one. Okay, exaggeration. Just a million. Seriously, kids get given a lot of pencils. There are cute pencils out there with fun designs and characters, but the vast majority of those just end up being a frustration. Your child will have homework and you will want good pencils to work with. And the pencils I linked are the number one best seller on Amazon for pencils. So if I love it and then look it up on Amazon and see it is their best seller and rates well, I feel very confident in steering you in that direction. If you are going to have pencils at home and homework happening at home, you will want a pencil sharpener. A little more than two years ago, I bought the School Smart Electric Vertical Pencil Sharpener. With three kids using it, including one very obsessed artist who is sharpening pencils a whole lot, it is still going strong. I love it. It sharpens well and it is easy enough for all of the kids to use independently. Your child’s teacher may or may not allow water bottles at the desk at school. If not, your child might want a water bottle to keep in the backpack for recess or after school. If your child is just starting off with a water bottle, I really recommend starting with something inexpensive and seeing how well your child takes care of it. We have started off with a Rubbermaid water bottle or just one of the many water bottles we have collected over the years. These Rubbermaid are just over $5 each, but you might see them cheaper in your local store as back to school season approaches. As your child shows responsibility, a stainless steel water bottle is always nice. Whatever your child uses, just be sure that thing comes home regularly to be washed ;). Insulated–this is a must for me, which is why I can’t get the cheapest. Easy to clean–some are much easier to clean than others. I want one that is either made of easily wiped clean material or has a plastic insert I can put in the dishwasher. That is really it. I know Bento Lunch Box style is popular right now and that might appeal to you. My hesitations with them is A) they are usually more expensive than I want to spend since I change it up every year B) If it is leakproof, it is hard for kids to open. If it isn’t leakproof…well it leaks. So I am not sold on that idea at this point. This is not for your children but for you. You will be so happy if you have a good way to keep track of the papers that come home from school especially once there is more than one child bringing papers home. I love the ADVANTUS Panel Wall 3-Pocket Organizer. Love. I have written all about my process in the post Managing the Paper Influx. Like I said, the list will vary from teacher to teacher. Notebooks, folders, paper, crayons, markers, scissors, pencil cases…really that is all kind of personal preference and needs to be considered based on what the usage will be. Will a folder be handled multiple times daily? Then a really good quality is probably a good idea. Or you could buy 10 of the ones that go on sale for 10 cents and switch it out every month. I always like Crayola brand best for markers and crayons. For a lot of these things you really can just go to Target, Walmart, Staples…whatever…and choose what is the best deal and be just fine. Just always keep in mind that children can be hard on things and sometimes the best deal is not what is the cheapest.